A transformation in environmental law in India began in 1985 when an Indian lawyer, M.C. Mehta, persuaded India`s Supreme Court to rule that Article 21 of the Indian Constitution, which guarantees each citizen the "right to life," necessarily includes the "right to a healthy environment." The implications of this ruling are far-reaching: Each Indian citizen now has the right to seek enforcement of India`s environmental laws by filing a writ petition to the Supreme Court of India, or a State High Court. In 2000, M.C. 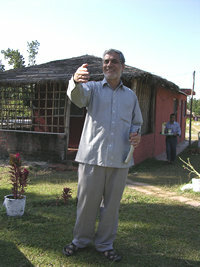 Mehta achieved a long-held dream to build an international facility for teaching public interest environmental advocacy. The M.C. Mehta Environmental Foundation`s facility is located in the tranquil village of Medawala, at the edge of the forested foothills of the Shevalik mountains, where wild elephants and leopards roam. M.C. is using the facility to pass on his invaluable experience protecting the environment through law to a new generation of grassroots advocates around the world. E-LAW U.S. Staff Scientist Mark Chernaik traveled to northern India in October to help direct a Young Lawyer’s Training Workshop aimed at empowering a new generation of environmental defenders. The workshop was hosted by M.C. Mehta at the M.C. Mehta Environmental Foundation’s facility in Medawala, Dehradun District. The workshop was attended by 14 attorneys from India, Nepal, Pakistan, Bangladesh, and Sri Lanka. These attorneys renewed their commitment to building a sustainable future through hands-on training and heartfelt discussion on how to sustain a public interest environmental law practice in the face of social, economic, and political challenges. Trainees drafted pleadings, delivered oral arguments, and participated in three moot court sessions presided over by eminent Indian jurists, including Supreme Court Justice M.B. Shah and former Supreme Court Justice Kuldip Singh. Other training sessions were led by Shri R.K. Upadhyay, a professor of forestry and wildlife law at the Indira Ghandi National Forest Academy; Shri P.C. Tyagi, former Chair of the Central Pollution Control Board (equivalent to the U.S. EPA Administrator); and Dr. T.K. Joshi, director of the Center for Occupational & Environmental Health (equivalent to the U.S. OSHA Administrator). Participants found the training invaluable and breathed a collective sigh of relief as they learned that they were not alone in facing the challenges of their work. They learned that they could call upon a cadre of committed public interest environmental lawyers in E-LAW’s global network to provide them with the assistance and legal and scientific resources they need to protect South Asia’s environment through law. The India workshop was the second of three in a Young Lawyer’s Training Workshop series. E-LAW U.S. Staff Attorney Alex Hanafi helped facilitate the first workshop in June, 2003, in Anuradhapura, Sri Lanka, with partners from Sri Lanka’s Environmental Foundation Ltd. and Public Interest Law Foundation. The workshops are generously supported by the U.S. State Department’s Bureau of Educational and Cultural Affairs. M.C. Mehta has achieved unparalleled success protecting the environment and public health through law in India, winning numerous Supreme Court judgments on behalf of India’s citizens to preserve India’s natural resources and cultural heritage. In a recent victory, M.C. successfully petitioned the Supreme Court of India to enforce a 1991 decision requiring environmental studies as a compulsory subject at all levels of Indian education. The December, 2003, court order requires that green curricula be taught in all of India’s 28 states. In 1991, M.C. obtained the original Supreme Court order, requiring mandatory environmental education to fulfill the fundamental duties of citizens to “protect and improve the natural environment,” as set out in India’s Constitution. E-LAW U.S. has collaborated with M.C. Mehta since 1991. M.C. has traveled to Eugene to work with E-LAW U.S. on several occasions and brought his family for an extended stay in 1996. E-LAW U.S. Staff Scientist Mark Chernaik traveled to northern India in October to help direct a Young Lawyer’s Training Workshop aimed at empowering a new generation of environmental defenders.